With Harry Stafford. Whitman often stayed with the Stafford family at their farm in New Jersey where he spent restorative time by Timber Creek, regaining his health. 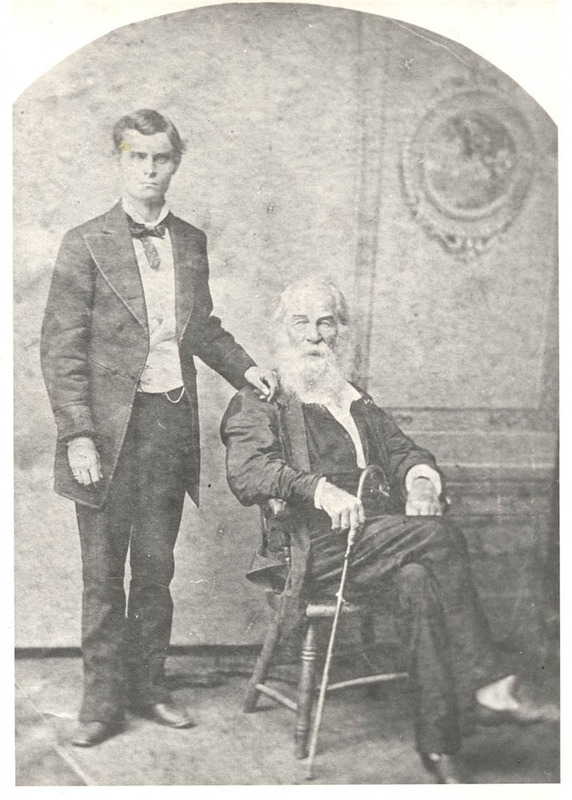 In 1876 Whitman entered an intense and stormy relationship with young Harry, who often accompanied Whitman to the creek and to whom Whitman gave a ring; the ring is visible in this photo on Harry's right hand. The ring was taken back and re-given over the next couple of years, and clearly was thought of as a symbol of deep commitment; Harry wrote to Whitman about wanting the ring back in 1877 "to compleete [sic] our friendship." During one of Harry's visits to Camden in February 1878, Whitman notes: "Feb 11—”Monday—”Harry here—”put r[ing] on his hand again—”had picture taken at Morand's cor Arch & 9th Phil: for Michener, cor Arch & 10th" (DBN 85). Morand and Whitman may have had a long-standing acquaintance; he had a studio at 377 Broadway—on the same block as Fowler & Wells—for almost all of the 1850s. Or, more intriguingly, perhaps Whitman chose Morand's studio because it was partnered with W. Howard Michener, a painter at 914 Arch St. Whitman pasted Michener's card into his daybook some time in the fall of 1877 (DBN 72). Saying that the photo was taken "for Michener" seems to indicate that Whitman at least planned to have a painting made from the photo. Perhaps the painting was never undertaken due to the stormy nature of the Whitman/Stafford relationship and their long separations. Harry wrote Whitman: "You know when you put it on there was but one thing to part it from me and that was death." During these years, when they were apart, Whitman wrote Harry intimate letters: "Dear Harry, not a day or night passes but I think of you. . . . Dear son, how I wish you could come in now, even if but for an hour & take off your coat, & sit on my lap—" By 1881, Whitman credited Harry with having saved his life: "Dear Hank, I realize plainly that if I had not known you—if it hadn't been for you & our friendship . . . I believe I should not be a living man to-day—"